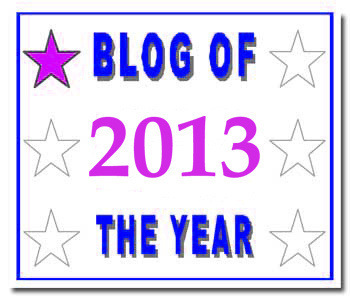 Blog of the Year Nomination! As mentioned in my previous post, There are Dragon’s Everywhere, 3 of my fellow bloggers had nominated me for awards in the past few days. In that post I wrote about the two Dragon’s Loyalty Awards I had been nominated for, in this post I want to thank Jenn from My Fibrotastic Life for nominating me for the Blog of the Year 2013 Award. This is an amazing honour to me, especially given I’ve only been blogging for the past month! Jess (noonegetsflowersforchronicpain) writes about her life with chronic pain and the struggle and joys she has with having started a family since her accident. I have found her posts inspirational in helping me come to terms with achieving my goals even with a chronic illness. Jan (The Snail of Happiness) writes about living a sustainable life in whatever way you can. This is a topic that is very close to my heart and I’ve found that her words really resonate with me. Celeste (Baking, Butter, & Happiness) shares many of the same hopes and dreams for the future as me. She writes about living with chronic pain and cooking dishes that reduce pain. Congratulations to all three of you, obviously I wish I could nominate each and every one of the blogs that I read but energy and logic dictates that I keep this list short. Previous There are Dragons Everywhere!